An easy, delicious and extra flaky take on coconut cream pie. 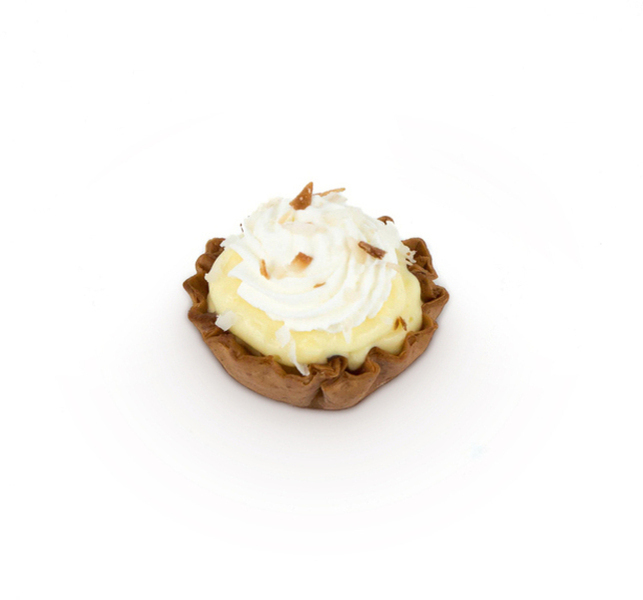 Graham cracker phyllo shells filled with caramel & rich coconut pudding and topped with toasted coconut flakes. In a medium bowl, whisk together pudding mix and milk. In a separate chilled bowl, whip heavy cream, confectioners sugar and coconut extract until stiff peaks form. Fold 1/3 cup whip cream into pudding mixture. Chill mixture for at least 30 minutes. In a small microwave safe bowl, heat salted caramel topping in microwave 20 seconds or just until topping is fluid. Spoon ¼ teaspoon of salted caramel into each phyllo shell distributing it evenly on the bottom of each shell. Pipe or spoon chilled coconut filling into phyllo shells. Top with remaining whipped cream. Garnish with toasted coconut and serve. Inspired by the French classic, this dessert puts banana slices, kiwi slices and a delectable passion fruit pastry cream between flaky Phyllo Napoleon layers. 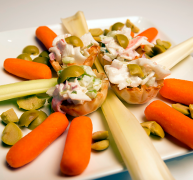 A breeze to prepare, these versatile Mini Phyllo Shell appetizers feature a creamy crab salad, but lobster, tuna or chicken can be easily substituted.